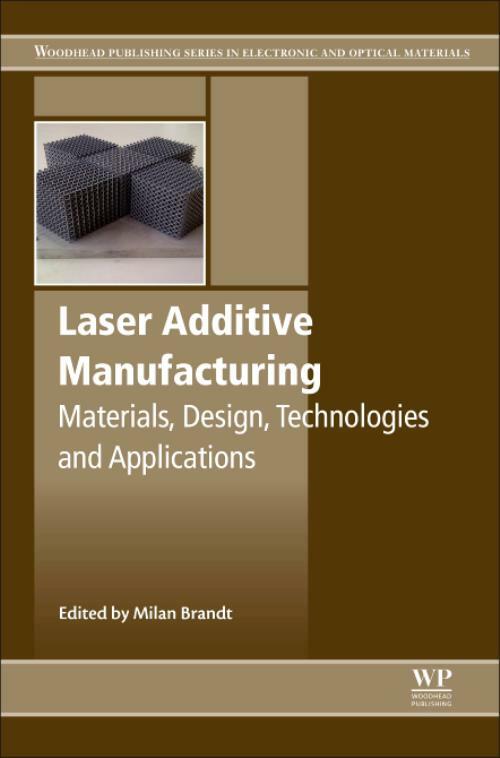 Laser Additive Manufacturing: Materials, Design, Technologies, and Applications provides the latest information on this highly efficient method of layer-based manufacturing using metals, plastics, or composite materials. The technology is particularly suitable for the production of complex components with high precision for a range of industries, including aerospace, automotive, and medical engineering. This book provides a comprehensive review of the technology and its range of applications. Part One looks at materials suitable for laser AM processes, with Part Two discussing design strategies for AM. Parts Three and Four review the most widely-used AM technique, powder bed fusion (PBF) and discuss other AM techniques, such as directed energy deposition, sheet lamination, jetting techniques, extrusion techniques, and vat photopolymerization. The final section explores the range of applications of laser AM. Milan Brandt is Professor of Advanced Manufacturing in the School of Aerospace, Mechanical and Manufacturing Engineering at RMIT University, Australia. With 25 years' experience, Professor Brandt is one of the world's leading experts on laser additive manufacturing. He has published widely on laser manufacturing, served as a board member of the Laser Institute of America on several occasions as well as on the advisory boards of major international conferences such as the annual International Congress on the Application of Lasers and Opto-Electronics (ICALEO).